Welcome to the Raka Weekly Roundup, where we cover the week’s news and trends and tell you exactly what you need to know. This week, we’ll let you know what Google ranking factors to pay attention to for 2019 and tell you about changes to Google My Business and HubSpot’s Marketing Hub Enterprise. If you’re a business or digital agency serious about inbound marketing, you’re forever trying to figure out Google’s algorithms to try and improve your search engine results. Newsflash: That’s one mystery that will never be solved. Google has always kept this information close to the vest, but they have confirmed they look at about 200 ranking signals when determining organic search rankings. Fortunately for all of us, Single Grain and Backlinko have taken it upon themselves to crack the code of what these factors are and have created an awesome infographic to help the rest of us optimize our search rankings even if we’ll never be able to unravel the entire mystery. Domain Factors – Of course having your main keyword in the domain name is a huge factor, but did you know if you prepay for your domain name registration Google will notice. Apparently, legit domains pay for their domain name several years in advance while the shifty ones are rarely used for a year. So if you’re in it for the long haul, prepay for your domain registration for the next 5-10 years to get in Google’s good graces. Page-Level Factors – Again, keywords are key, but other things to pay attention to are page loading speed, duplicate content, image optimization, how fresh your content is, number of internal and outbound links, and using bulleted and numbered lists. Backlink Factors – Like a fine wine, backlinks from an older domain gets more love from Google than if it comes from a domain that is new to the game. Why? For the same reason mentioned above. With age comes wisdom and trust from Google. This also plays into the fact that all links are not created equal. Your site will bode well if the PageRank of the referring page is a winner with Google. User Interaction – When it comes to user interaction, Google is keeping an eye on how much traffic comes to your site, whether it’s repeat traffic, how much they click on a link to your site when it’s served up in a SERP, and believe it or not, if you bookmark the site on Google Chrome. This is a great tool to use to look at your website and determine its weaknesses so you can spend the rest of the year buttoning it up to start the new year off with a bang. If you have a Google My Business account, you may have seen an option to add products to your listing. 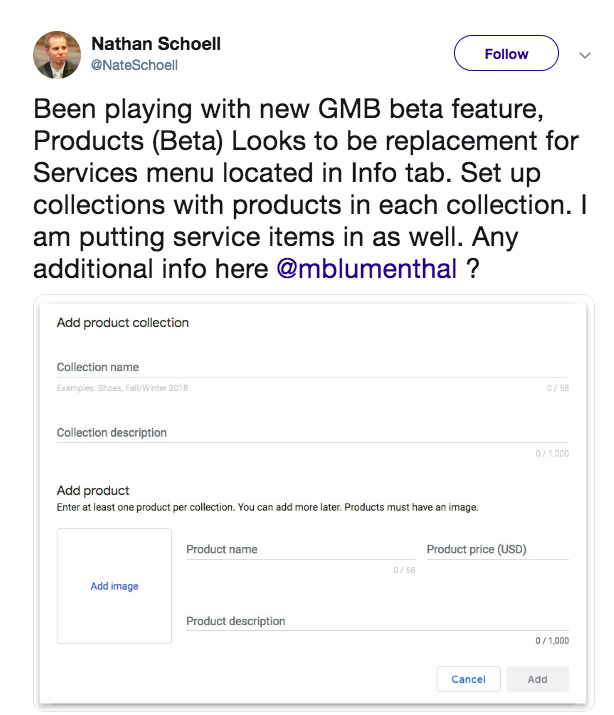 It seems this is something Google is testing out on some accounts according to local SEO specialist Nathan Schoell, who posted a screenshot on Twitter that was first reported on by Search Engine Journal. Businesses can list a product collection name and description and for each product in this collection, add the name, 1,000 character description, price, and a photo. In Schoell’s case, it took the place of being able to add a service, but apparently, service-based businesses will still have this option. This addition, when rolled out to the masses, will be great for local businesses to showcase their products and for consumers who are searching for them. On November 1, HubSpot’s Marketing Hub Enterprise is getting a lot of product changes as well as a pricing change. According to HubSpot, here’s what’s on the horizon. Now you can segment and set permissions for your blog, landing page, and web page content by attributes such as team, vertical, or region. You will be able to add additional Brand Domains to your HubSpot portal that you want to host, publish, and partition content to. This feature comes at a cost of $700. Get a better look at your data by creating up to 25 unique analytics views that you can filter by subdomain, URL path, or country. YouTube reporting will be available with your other social media accounts in your HubSpot dashboard so you can track the performance of your videos over time as well as the success of each individual video. To avoid spamming your contacts with an annoying amount of email, now you can set a cap on the number of emails a contact will receive in a given time period. However, you’ll be able to override this cap if you have a high-priority email you really need to send out. One other feature that is just getting an enhancement is social permissions. You’ll be able to set draft only permissions for specific users so Typo Tim won’t be sending out any embarrassing tweets. Of course, all good things come at a cost. Effective November 1, the Marketing Hub Enterprise base price is increasing from $2,400 to $3,200, however, all existing Marketing Hub Enterprise customers can enjoy these features at their current pricing thanks to HubSpot’s grandparenting policy. If you’d like to talk about these trends, or need help getting any of your marketing initiatives off the ground, reach out to us.